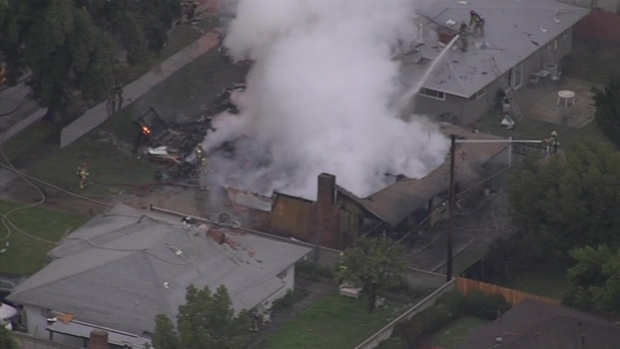 The small plane that crashed into four Southern California homes Monday evening, killing at least three people and injuring two others, was registered to a San Jose address, according to FAA records. 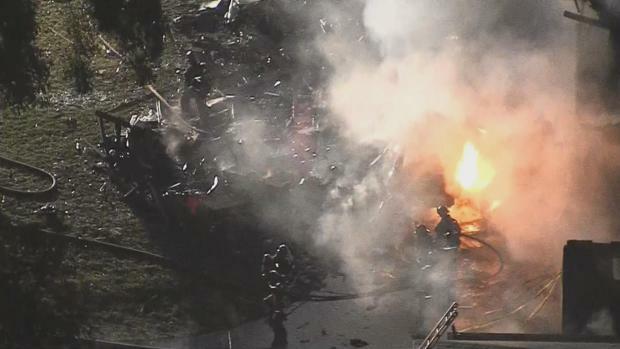 The Cessna 310 crashed under "unknown circumstances" about a half-mile northeast of Riverside Municipal Airport, damaging four homes, fire officials said. "Upon impact, the plane pretty much split apart," Riverside Fire Department Chief Michael Moore said Monday. Three of the passengers, including a man, a woman and a teenage girl, were killed, but their identities have yet to be released as of Tuesday, according to Riverside Fire Department spokesman Tyler Reynolds. It is unclear if the victims were related, but they appear to be from the San Jose area. The two other passengers were ejected from the plane before being rescued and transported to the hospital, Moore said. Both women remained hospitalized Tuesday. 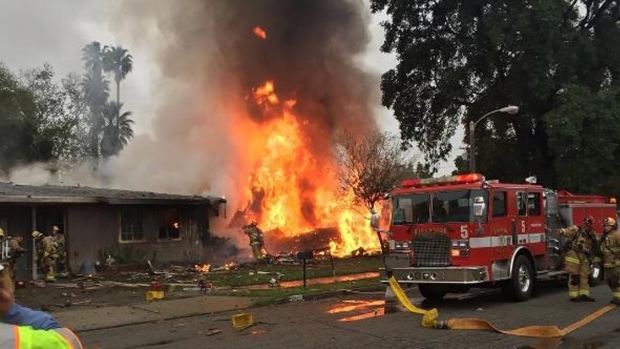 A home went up in flames when a small plane crash landed in Riverside. Watch raw video from Monday, Feb. 27, 2017. One of the women fell through the roof of a home and landed in a bedroom, where firefighters found her and got her out, fire officials said. That survivor suffered third-degree burns over 90 percent of her body and underwent surgery Monday night. The other woman, who landed on the front lawn of a burning home, has been upgraded to stable condition, officials said. The National Transportation Safety Board is investigating the plane crash. An NTSB official said Tuesday a preliminary report on the crash will come in 5-10 days and a full report is expected to take about 15-18 days. 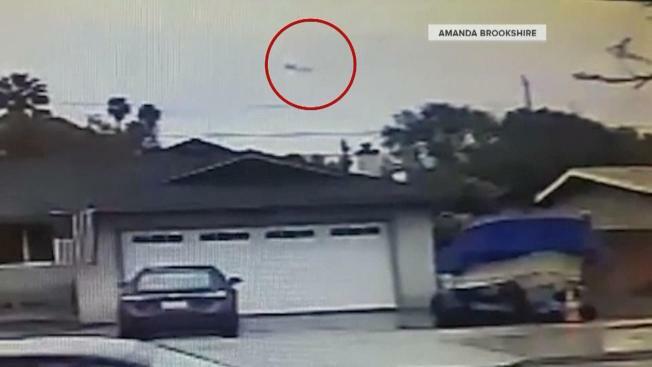 Nouri Hijazi, the listed owner of the Cessna, has been described as being an experienced pilot who was an avid traveler along with his wife, according to a neighbor in San Jose. However, officials on Tuesday reiterated that the identities of the pilot and the passengers have yet to be determined. The passengers were returning to San Jose after attending a cheerleading conference at Disneyland, Moore said. Students from Union Middle School in San Jose were participating in the cheer competition, but none of those students was on the airplane that crashed, according to the Union School District. Those students traveled back to the San Jose area by bus. The people on the aircraft are believed to be family members of one of the students. Union School District Superintendent Denise Clay said the district is providing grief counseling for Union Middle School students and staff who may have known the victims, noting that the community is tight-knit. "The principal was on the phone with staff members through the wee hours of the evening, just assuring people we're there, what can we do, how can we support you," Clay said. "And we don't know for sure (who was on the plane). Not knowing is frightening." One Union student said the campus is in mourning. "A lot of people were upset, and they were depressed the cheerleader couldn’t enjoy their victory," Amy Martel said. "Many of the cheerleaders couldn’t go to school. They were depressed." Grief counselors were on the campus of Union Middle School in San Jose on Tuesday following the deadly plane crash in Southern California. No students were on board the flight, but two of the students at Union are believed to have had family members on board. Michele Roberts reports. Reynolds added that no one on the ground in Riverside was injured as a result of the crash, but many were rattled. David Swinfard, one of the residents of one of the damaged homes, was sitting in his living room doing a crossword puzzle when the plane crashed. "I thought, I'm going to have to get out of here or I'm going to die," he said. Swinfard said he felt his house shook and that flames flew out everywhere. He immediately ran to the front door to escape and got only a minor burn. Daniel Hernandez, who lives in the neighborhood, described the sounds of the crash as a "very loud explosion." He said fumes entered his room and he could feel the heat on his face before he ran outside. Ana Duran, who lives just on the other side of where the plane went down, said that everyone in the neighborhood ran to see what they could do to help. "It just sounded like a bomb," Duran said. "I heard people screaming and yelling." NBC Bay Area's Peggy Bunker and Michelle Roberts contributed to this report.